Last night I laid out my running gear and charged Gary the garmin ready for a Sunday morning run. I went to bed feeling positive that I would head out for a run before it got too warm. This morning my alarm went off, I turned it off, fell asleep and woke up an hour later. Morning running opportunity missed again. I’ve decided that I need a short-term running target to aim for and train towards. I have loads of longer term targets but nothing to motivate me in the short-term. I considered entering the Great Birmingham Run but decided that my fitness levels aren’t at half marathon levels. I want to enjoy my running again, I don’t want to struggle to complete over ambitious training sessions. Enter the City of Birmingham 10k on September 7th and the Lichfield 10k the following week (it’s always good to have a second target). Accepting that I’m not currently capable of running a sub 50-minute 10k (my sub-40 PB seems like a lifetime ago) I spent an enjoyable hour researching beginner’s training plans. My training plan is now ready and waiting for me in Excel. 30 minutes: 1 minute walk followed by 2 minutes of jogging. Repeat 10 times. I suspect that I’m going to spend the majority of the time staring at my wrist. The training plan I’m following also emphasises the importance of cross training. I have a confession, I don’t do cross training. I suspect that I’ll find the ‘Squat to Rock’, ‘Runaway Arms’, ‘Charlie’s Angels’ and ‘Tummy Toner’ exercises far more challenging than the running sessions. I’m hoping that over the next six weeks I’ll rediscover my love of running. I need to stop finding excuses not to run. Spending 12+ hours’ a day working on my PhD thesis is stressful, but I need to stop using my thesis as a “get out of running” excuse. 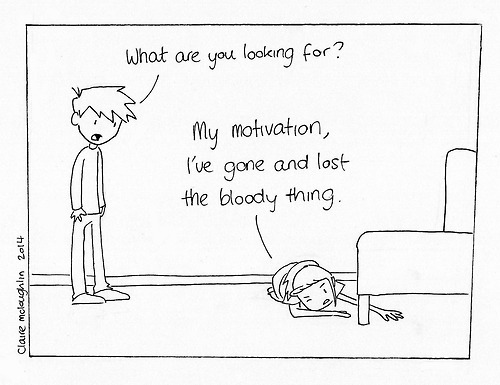 It turns out that my motivation was hiding underneath my bed with my missing heart rate monitor strap.